Water and Energy Rebates Rebates for purchases of qualified Energy Star appliances, or WaterSense labeled 1.28 gallon per flush toilets, are available to City of Ashland electric and water utility customers using a simple one page form, along with proof of purchase receipt. Appliance rebates, Lawn Replacement Program, Water Wise Landscaping website, Sprinkler System Evaluations, Surviving Drought information, tips for water savings, and more. This program is designed to encourage Ashland citizens and businesses to invest in photovoltaic generation installations by paying rebates for qualifying installations, as well as a net metering policy that provides credits for excess generation of energy. This program includes energy efficiency, water conservation, sustainable building practices, solar/net zero and EV Charging incentives for all new single family home construction (detached and attached). For mulit-family housing development, contact Conservation Staff and we will be glad to discuss custom options. 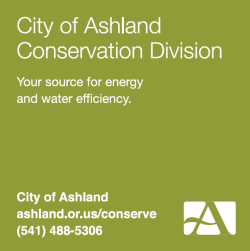 The City of Ashland has two custom programs designed to help Ashlanders mitigate their emissions. Renewable Energy Certificates (RECs) ensure that you are getting the environmental benefits of clean energy. Carbon Offsets (COs) reduce greenhouse gas emissions from other activities, such as vehicle travel or natural gas use.